Brexit supporters have been severely critical of the OBR for its grim outlook for the UK post Brexit. 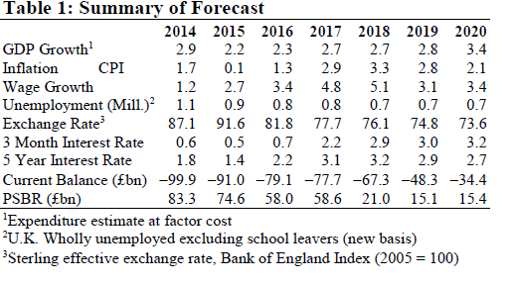 The OBR is by no means the most negative of the professional forecasting bodies, and historically its forecasts have tended to err on the side of optimism, as Duncan Weldon observes. But it struggles to find anything good to say about post-Brexit Britain. In particular, it is distinctly negative about the future for Britain's external trade. Brexit is above all a shock to trade, since its primary impact will be on Britain's trading relationships, not only with the EU but with other countries too. 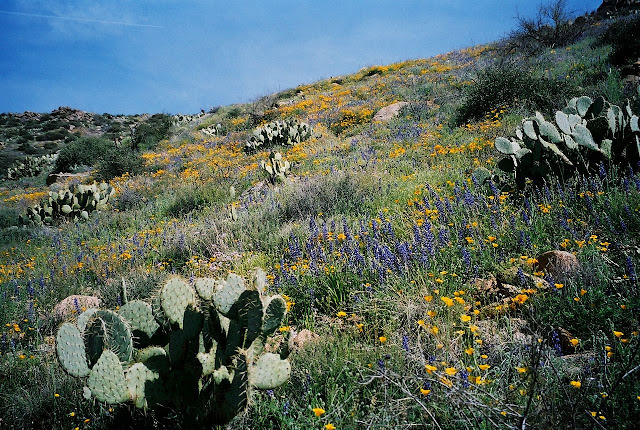 At present, we have no real idea what these will look like once the UK has left the EU. 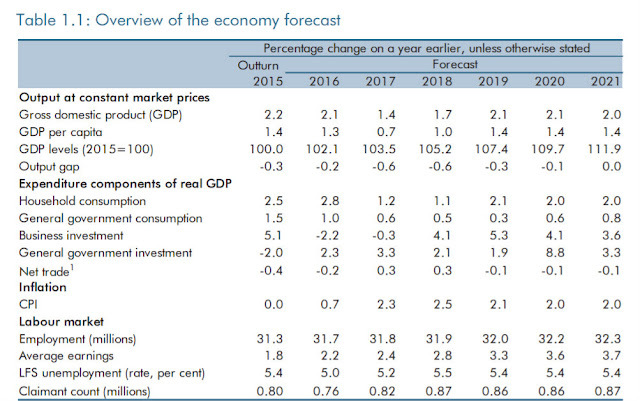 The OBR is therefore forecasting under extreme uncertainty. If there is one thing we can be sure of when forecasting under extreme uncertainty, it is that the forecasts are even more likely than usual to be wrong. This does not indicate that the forecasters are biased. It just means they have little reliable information. • the UK adopts a tighter migration regime than that currently in place, but not sufficiently tight to reduce net inward migration to the desired ‘tens of thousands’. However, it is not the only cause. Brexit will be implemented against the background of contracting global trade and rising protectionism. This is likely to hamper the UK's quest for new export markets considerably. The OBR forecasts that by 2020, gross trade will be lower than it was in the 2007-8 financial crisis. The worsening global trade outlook also seriously calls into question the assumptions made by Economists for Brexit regarding the economic effect of unilaterally abandoning trade tariffs. Positioning the UK as a beacon of free trade for the rest of the world is hardly likely to be an effective strategy for growth if the rest of the world is sticking two fingers up to free trade. When everyone wants to export and no-one wants to import, the country that unilaterally opens its doors to imports is inevitably flooded and its own supply side is crowded out. So UK businesses would face stiff competition from imports in addition to tariffs and other trade barriers for their exports. Economists for Brexit heroically assume that this would be entirely offset by improved export competitiveness from sustained sterling depreciation. 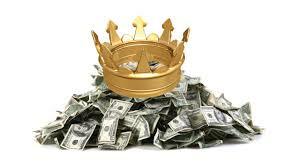 But when a consumer boom from cheap imports is combined with challenging supply-side conditions which are resistant to the stimulus of a lower exchange rate (as I shall explain shortly), sustained currency depreciation can have only one outcome. Inflation, here we come. To be fair, that is what Economists for Brexit forecast. Their medium-term estimates for CPI inflation are significantly above those of the OBR. Even so, I think they are not high enough, given the difficulties UK businesses face due to the worsening trade outlook. Economists for Brexit also appear to predict a wage-price spiral, since their forecast shows much higher wage growth than the OBR's. Unsurprisingly, they forecast higher interest rates. 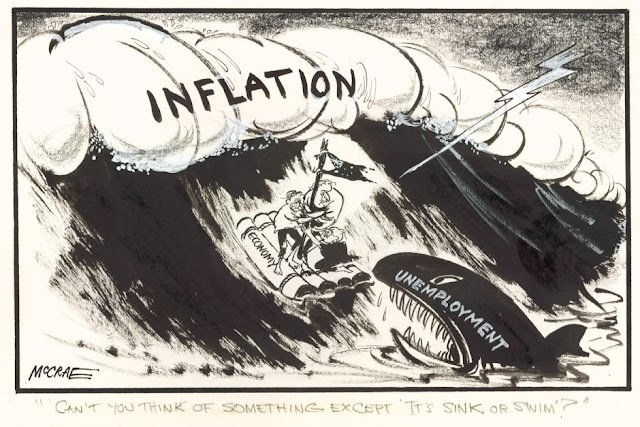 We haven't seen this combination of inflation, wage growth, falling sterling and rising interest rates since.....well, since the Volcker Shock. In fact Economists for Brexit's forecasts could be entitled "Back to the 1970s", apart from their amazing optimism about unemployment. Maybe I am scarred by my memories of the 1970s, but I don't regard their forecast as rosy. 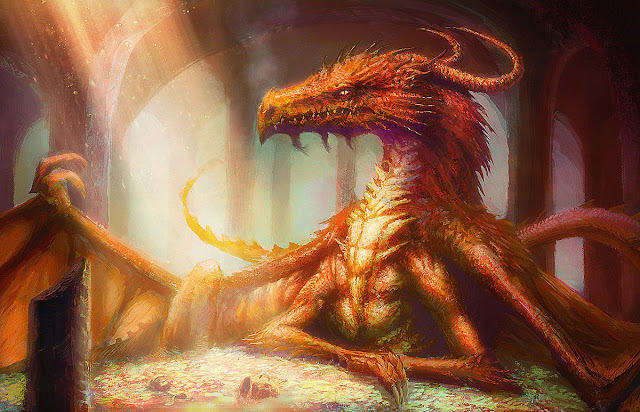 Sterling depreciation is a double-edged sword. It would boost exports to some extent: the OBR's chart shows a small boost to exports from this year's fall in sterling. But it would also squeeze household incomes and business profits because of inflation in essential goods, notably energy and fuel. In the oil price shock of 2011-12, households cut back discretionary spending sharply, derailing a promising recovery. They would be likely to respond in the same way to energy and fuel price rises due to sterling depreciation: they might also defer or cancel spending on other imported goods. 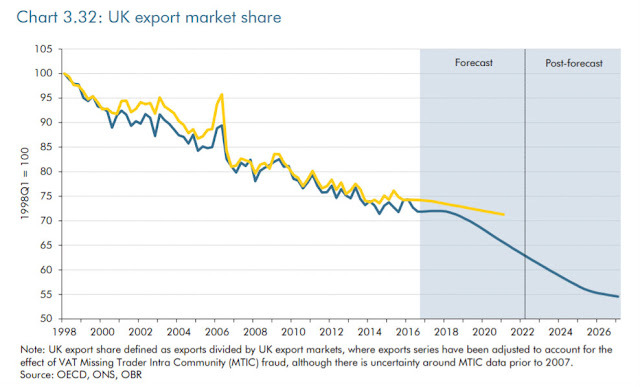 Consequently, OBR forecasts that imports will fall. 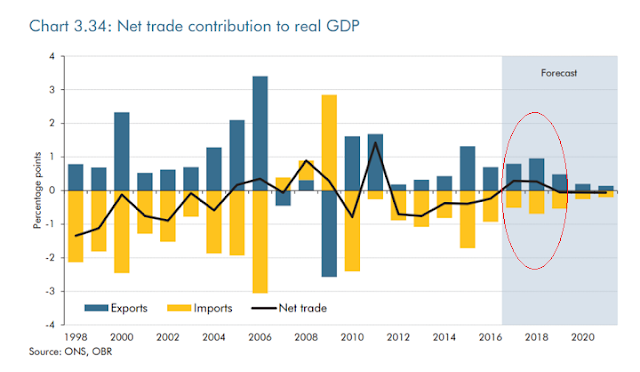 The OBR says that the combination of falling imports and increased exports will mean net trade turns positive in 2017-18 (I have circled this on the chart). However, the implied fall in domestic demand means lower, not higher, GDP growth than would have been the case without the Brexit shock. Fortunately, the shock is short-term and the OBR says the UK will return to growth of around 2% per annum thereafter, which is consistent with the views of other professional forecasters (though not, of course, Economists for Brexit). In short, there isn't going to be an "explosion of international trade", as some Brexit supporters have suggested - at least, not enough to reverse the UK's secular decline as a major trading power. The boost to net trade from sterling depreciation will be short-lived if the OBR's assumptions hold. If the UK government adopted Economists for Brexit's unilateral free trade policy, there would be a boost to imports as trade barriers were lifted, but this would also be short-lived. After that, worsening inflation, tighter monetary conditions and a difficult external trading environment would cause both imports and exports to fall, just as they do in the OBR's model. Whichever forecast you look at, the outlook for trade is indeed grim. I don't know what planet Jacob Rees-Mogg inhabits, but it isn't one I recognise. However, the outlook for the UK's external balance is not quite so grim. The current account deficit has been in the headlines recently because of its (considerable) size. This worries some economists because of the risk of a "sudden stop", and annoys the economic illiterates who think the UK should "pay its way" in the world. 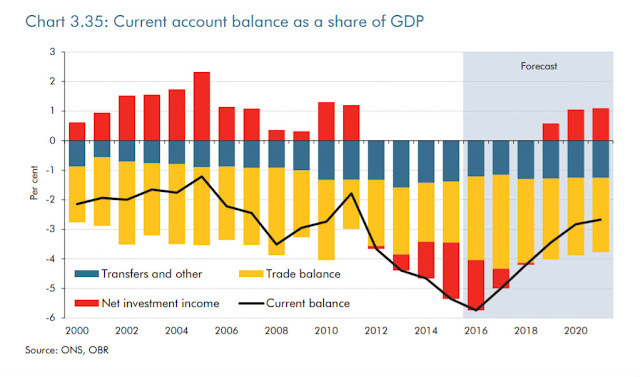 But as I have explained before, the current account deficit doesn't necessarily say anything about UK competitiveness. You have to look at the component parts to understand what is going on. Now that sterling is falling, the investment income deficit is closing even though UK interest rates are still above EU rates, since the difference is lost in the exchange rate. The OBR predicts that investment income will return to surplus by 2019, entirely due to currency effects. This is the only significant effect of sterling depreciation on the UK's external position, since the OBR forecasts that the trade deficit will remain at around 4% of GDP. Those obsessed with manufacturing and trade in goods will no doubt sniff at this, since investment income arises principally from the financial sector. But income is income, however it is obtained. Despite the improvement in the external position, this looks awful. The OBR forecasts a sustained 2% deficit for the household sector. That means rising debt. 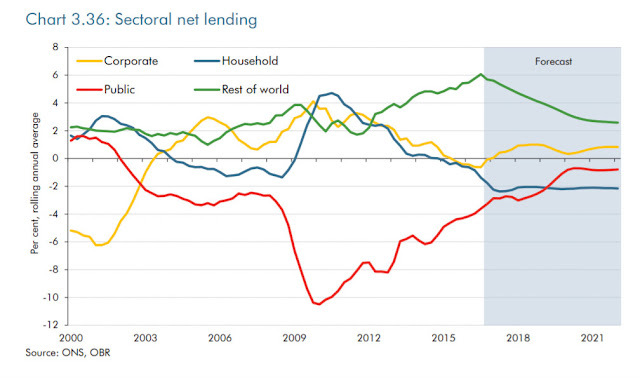 As the household deficit is partnered by a surplus for the corporate sector and closure of the fiscal deficit, the increased debt is likely to take the form of borrowing to fund consumption. This is anything but desirable. The persistence of a household deficit of this size would be unprecedented in the latest available historical data, which extend back to 1987. Other datasets extending back to 1963 also suggest little evidence of a large, persistent household deficit, with the household surplus moving into negative territory in only one year between 1963 and 1987. 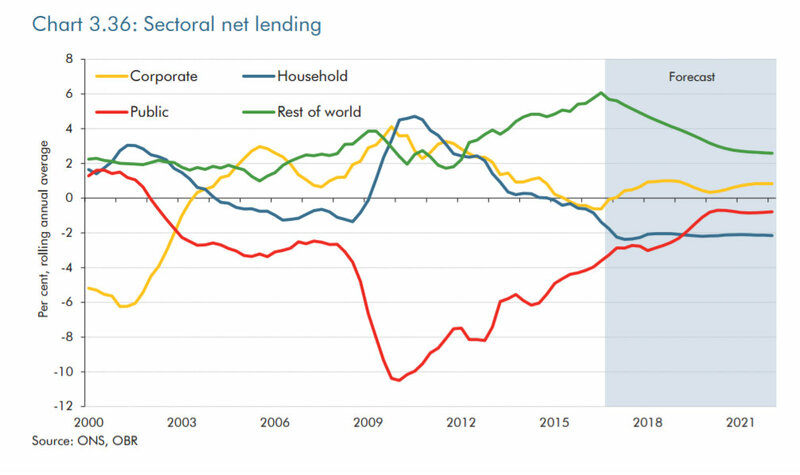 A household deficit of the size and persistence we expect over the forecast period might be considered consistent with the unprecedented scale of the fiscal consolidation and the extremely accommodative monetary policy upon which our forecast is conditioned. It nevertheless demonstrates that the adjustment to the fiscal consolidation is subject to very significant uncertainty, and alternative adjustment paths are quite possible. These are not mutually exclusive, and the eventual outturn could well be some combination of all of these. What is unlikely to happen is an export miracle. We are not Germany, and this is not the 1950s. It looks uncomfortably like the early 1930s, when countries put up trade barriers and devalued their currencies to steal export share from each other. That ended really well, didn't it? Though of course, a miracle could still happen. For if there is one thing we can be certain of, it is that forecasts made under extreme uncertainty are unusually likely to be wrong. The UK government might like to be involved in financing UK companies to build infrastructure in the rest of the world. Like a boot model. Sterling could be more stable if there were steady revenues in other currencies being paid into Britain. It also leverages some strengths of Britain: financing, engineering and good legal structures. Looking at the rest of 2016 I would suggest the OBR could save themselves a lot of bother if they clarified when they produced their figures. If it was in the summer before a lot of the upbeat data came out from the ONS then it is clear that they had a misguided view of the rest of 2016. But if that data was to hand then there is no explaining their figures for the rest of 2016. Growth they say is to be 2.1 but it is already 2.3 at the end of q3 with surely a solid Q4 still to come to further increase the annual above even the brexit economists forecast. It looks to me as if the data was not to hand simply from their cpi figure of 0.7. It is already 0.9 and can't be coming down before the year end. Still it has to be said for growth figures put out on a Wednesday to be more or less disproved two days later by the ONS is the current problem with forecasting. Longer term forecast have greater uncertainty but this is the shortest of short forecast and seems out disproportionately for closeness to the period forecast and the shortness of the period forecast.